Octillery should’ve made the top 10 of the set but it didn’t (https://www.pojo.com/COTD/2016/Jan/8.shtml). The ability is why Octillery sees play; it draws cards until you have five cards in your hand. As long as you got tricks that can thin your hand, than Abyssal Hand will keep generating a better return. Octillery does bring some to the table that Delphox XY or Oranguru SUM didn’t. It can be brought from the discard pile into the Bench via Archie’s Ace in the Hole and it can be healed via Rough Seas. Even without those cards, Octillery is still run as frequently as ever. Conclusion: Octillery may be leaving Standard, but fortunately we have no shortage of Ability based draw in which such a Pokémon will be the next best option and will be run frequently. Popularized by Donald from Dark Integral Gaming (who should probably be called the Cover Master as he has the best music of ANY Pokemon channel and it’s all stuff he has arranged himself! ), this octopus has most recently been an accomplice to the muscle bound mosquito Buzzwole, but you’ll also find it in last year’s world championship Gardevoir GX deck and many other decks that don’t contain a Pokemon whose name starts with the letter G and rhymes with Garbodor. So I did some digging WAY back to try and find how common Octillery was for me in the past. I actually only saw it in about 5 to 10 percent of decklists from February 3 2017 through August of 2017. I didn’t keep stats in August of 2017 (there’s no point that’s such a crazy month meta wise and I was playing strictly rotation on decks), but in September of 2017 Octillery’s usage increased to 18% of the decks I faced. October, November, December of 2017 and January 2018, its usage dropped back down into that 7 – 8% range, but then jumped back up in February where it was in 15% of the decks I went up against. March through June dropped a little again, all falling within the 10 to 12 percent range. Still, it has always been one of the most frequent Pokemon I come across. As recently as May and June of this year, it is the sixth most common Pokemon I see. We all know what Octillery does: it gives you more cards. The more cards you have, the more options you have. The more options you have, the more likely you are that one of those options will lead you down a path to victory. Bottom line: Octillery helps you win games. I’m sure I did a study at one point on it (I think with the Promo Lycanroc GX, before Bloodthirsty Eyes came out, but I can’t find it), twenty matches with Octillery in the list and twenty matches without it in the list, and I’m sure it won something like 75% of matches with Octillery and only 67% without. Obviously, it’s not for every deck, it does best in decks that run a lot of insta play Item cards, and Stage 2 decks or decks that run a lot of energy tend to get less draw from it, but – in the right decklist – Octillery can do wonders for your deck’s consistency. Let not your hearts be troubled though dear readers… we have cards coming out that are even better! Many of us are looking forward to Zebstrika (I think that will be out in November) which forces you to discard your hand but then draw 4 cards. There’s also Swampert from Celestial Storm, which is Zoroark plus 1 (discard a card and draw three instead of two). We are even getting Plusle in Celestial Storm that shuffles and draws cards equal to the total number of benched Pokemon (although that is an attack). So we have plenty of options to replace the Sushi master, the only question will be what nickname will Donald decide to give to them? The card we’ll miss the sixth most post-rotation is Octillery (XY – BREAKthrough 33/162). We’ve only looked at this card once before here and you might be surprised to know that Octillery did not make our top 10 list for XY – BREAKthrough, though it should have. We’re not going to sweat the card specifics, other than mentioning that yes, they do matter; tweak the Typing, the Stage, the HP, etc. and you can make this card better or worse, but we’re going to miss Octillery because the “sort of budget Shaymin-EX” became the “sort of budget Zoroark-GX” or better Oranguru (SM – Black Star Promos SM13; Sun & Moon 113/149) while Tapu Lele-GX became the replacement for Shaymin-EX even though it searches out a Supporter when played from hand instead of drawing until you have six cards in hand (the effect of the Ability found on Shaymin-EX). The thing is, barring some eventual new release or unannounced reprint, we’re moving from a familiar era where we’ve always had a “Discard your hand and draw seven cards.” Supporter available. Losing Professor Sycamore is one thing, but we are also losing N; if it wasn’t for Cynthia having released when it did and quickly joining the big two to make them the big three draw Supporters, we’d really be lost. Not necessarily worse off, but in a strange, unfamiliar place. We do have Cynthia, but reusable Ability-based draw will most likely become more important than it already is, especially considering cards like the pseudo-reprint of Magcargo (EX – Deoxys 20/107) we are supposed to be getting in SM – Celestial Storm. Octillery hasn’t always shown up with Gallade (XY- BREAKthrough 84/162), but when they do show up the combo is quite nice… how much more so ensuring the topmost card of your deck is exactly what you want. Which is what Smooth Over does, for the uninitiated. I’m not saying that Octillery would become a deck staple but I am saying it had good potential post-rotation and has already done well in the present and its past so… we’ll miss it. Which is why Octillery earned 85 voting points by appearing in all three personal top 10 lists. The Octobot makes an appearance, yet an underdog in form but a god in usage. Octillery from XY BKP is a Stage 1 Pokemon, a Water type with 90 HP. You may think that this is a small amount of HP, and for most of us, yes it is quite small for a Stage 1. A retreat cost of 2 is even worse, which means that you need to give a DCE or 2 manual energies just to prevent it from stalling the Active slot. One might argue that we have Float Stones or Pokemon with abilities that switches the Active Pokemon around, but for the most part it still requires some investment. Made even worse is the fact that it basically has a useless attack – Hug deals only fourty damage with an energy cost of WWC, and it prevent manual retreat of the opposing Active Pokemon next turn. With the myriad of abilities and tricks to forcefully switch Active Pokemon around, the side effect is as good as dead. But no, its not the attack or hp count that propelled Octillery to stardom. 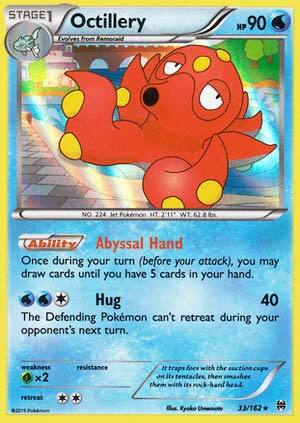 Abyssal Hand, the ability is what makes Octillery a hero. If you have less than 5 cards in hand, you can use this ability to draw until you have 5 in hand. Keep in mind that this ability stacks with each Octillery, so you can potentially see up to 20 Octilleries in play – but I guess nobody’s that mad, will it? Usually decks play 2 Octillery BKT, so its an average of 6-8 cards drawn via this ability. Its a draw engine, and what’s more, it offers the best compromise of draw power from the 3 available ability-based Pokemon draw engines. Oranguru SUM may have more bulk and packs more damage PLUS its a basic, but it can only draw until you have 3 cards in hand. Its too slow, but there are decks that wants slow draws. Zoroark-GX can draw indefinitely and has a good attack in Riotous Beating, but you need to discard a card to see 2 more, and also its a Pokemon-GX which gives up 2 prizes upon defeat and its a Stage 1. Octillery, on the other hand, is also a Stage 1, but it is a 1 prizer, so the liability is low and it can draw up until you have 5 cards with nothing else to pay for other than having less than 5 cards in hand. What’s more, pricewise it sits on the middle of the road as one of the best budget draw engines for decks, if one might not able to afford a Zoroark-GX because of its unreasonable asking price. As one of the best draw engines in this generation, decks will dearly lose a lot of what glues the deck together, especially budget players who don’t want to shell a lot on building decks. Its a shame, but lets hope for a more affordable option in the future.